The Indo-OIC Islamic Chamber of Commerce and Industry (IICCI) welcomes you to join our global chamber and benefit from our selection of activities, information and services. Since 2016, Indo-OIC Islamic Chamber of Commerce and Industry (IICCI) has been the premier supranational platform for global business networking. 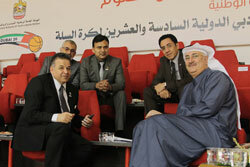 Our members find in IICCI an ideal forum to develop global business partnerships and promote global business activities. • Promoting the vital role of businessmen in India, OIC Nations, and other World. • Increasing India, OIC Nations, and other World business activities. • Enhancing India, OIC Nations, and other World economic growth. By leveraging our global network of chambers of commerce and Industry in the India, OIC Nations, and other World region, IICCI reaches thousands of enterprises, from SMEs to large conglomerates in Asia, Africa, Europe, America and the Pacific. By working in conjunction with our members, IICCI promotes global business networking and cooperation, disseminates relevant business information and jointly advocates for our members’ benefit, thus allowing IICCI to become the Premier Business Network in the India, OIC Nations, and other World region. Let’s have a look at a glance of the economy Nationally and Internationally. The globalization of economies thus poses challenges both for the developed and developing world. India, OIC Nations etc., itself has been confronting a multitude of global challenges, both internal and external. The impact of globalization has generated some kind of governmental, social and ethical pressure on the business sector in most countries that have embraced trade liberalization to regulate itself with due diligence, accountability and transparency. The IICCI, International Chamber of the Lucknow, India based Indo-OIC Islamic Chamber of Commerce and Industry (IICCI), the world business organization, in particular plays a proactive role in safeguarding the interest of the domestic & international producers and business but not at the cost of the consumers. IICCI since its inception in 2016, has been playing lead role in the development and the growth of external trade and investment of the India, OIC Nations etc., and other World. The National Branches/Chapters, National Directors of IICCI works closely with the Government and major trade bodies of the Country in reforming regulations to modernize business sector. The National Branches/Chapters of IICCI from the very beginning has been playing a pioneering role by arranging international conferences, seminars, workshops, dialogue for professionals of banks, non-banking financial institutions, insurance companies, multinational and national companies, trade bodies and global business houses for improving their expertise and keep abreast with latest tools in dealing developing their technical capabilities in dealing with various trade and investment issues. May I, therefore, take this opportunity to request all concerned to help us in this direction by providing intellectual inputs to the website as well as their contribution to IICCI. I invite you to come and join us in our pace-setting endeavour in the changed scenario of world business. Dr. Mohammed Seraj ANSARI - With more than 15 years experience of leading consumer-based own many companies in an entrepreneurial ship role; Dr. Mohammed Seraj ANSARI oversees the day-to-day operations of deferent departments in his own many group of companies and organizations. Prior to PrimieX Logistics Pvt. Ltd Dr.ANSARI founded and served as CMD of ISE Cards India Limited,, CMD of Buktel Communications Private Limited, CMD of MD of Edughar Career Solutions Pvt. Ltd CMD of Meraj Realty Infrastructures Pvt. Ltd, Vice President - United Students Associations Inc,USA, and CEO of The Meraj Distributors, Dr. ANSARI is serving as President - International Non-Olympic Committee-INOC, President-International Nobel Peace Prize Recommendation Forum-INPPRF, President-International Yoga Committee -IYC , National President-Indian Non-Olympic Association-INOA, National President-Floorball Federation of India-FFI and good relation with world sports leaders and also with governments, public institutions and corporations, and private individuals on a worldwide, Dr. ANSARI also serving as Chairman of Indian Textiles & Handicrafts Exports Promotion Organizations-ITHEPO, and under his leadership, the company/organizations made the several achievements in the country as well as International level. Mohammed Seraj ANSARI has became founder and President of INTERNATIONAL NON-OLYMPIC COMMITTEE-(INOC), The INOC is the world second largest Sports body after “Olympic” The Non-Olympic mission has been created by me and India is became founder of the world second highest sports governing body, which is controlling all Non-Olympic sports worldwide. (www.non-olympic.org). Dr. Mohammed Seraj ANSARI has became founder of International Non-Olympic University- (INOU), The INOU is acting as "World 1st Mega University" (A Mega University itself establishing an University in each country of the World, with the aim of “One World !! One Education! !” This is the first concept in the history of the World Education). The International Non-Olympic University - INOU would set-up a National Non-Olympic University (Online & Regular) under prevailing University Recognition Act of respective country, The INOU’s new endeavor has been appreciated by the leaders of the world, The H.E. Secretary General-United Nations (UN), H.E. The Secretary General-Organization of Islamic Cooperation (OIC), The H.E. President-European Council (EU), H.E. President of Ireland, Hon’ble Prime Minister of Ireland , Hon’ble Prime Minister of Norway, Hon’ble Prime Minister of Singapore , Hon’ble Prime Minister of Hungary, H.E. Governors of India, and Ministers etc., several leaders have sent best wishes for grand success of new educational approach to the new world. Can view few comments; http://www.inou-edu.org/WorldLeaderComments.html (www.inou-edu.org). Dr. Mohammed Seraj ANSARI has became President of INTERNATIONAL NOBEL PEACE PRIZE RECOMMENDATION FORUM-(INPPRF), The INPPRF is the only International movement and came into forced to support the Nobel Foundation and it's Committees worldwide as well as all World Peace Movements/International Sports Organizations. Inspired by the mission of the Nobel Foundation "Nobel Peace Prize", the International Nobel Peace Prize Recommendation Forum was created in 2004 with the practical support by the International Non-Olympic Committee-INOC. (http://www.nobelpeaceforum.org/NNIL.html). Dr. Mohammed Seraj ANSARI has became President of WORLD COUNCIL FOR REGULAR & DISTANCE EDUCATION-WCRDE, The WCRDE is the non-profit international membership organization for the regular, open and distance education community, and is open to all educational institutions, educational universities, educational authorities, and individuals. WCRDE has a partner status with International Student Exchange Cards India Limited. WCRDE main aim is to promote distance education throughout the world and use of new idea and innovation. (http://www.wcrde-edu.org). Dr. Mohammed Seraj ANSARI has became President of WORLD SPORTS KARATE FEDERATION-WSKF, The WSKF is the international Governing Body for Sports Karate, the World Sports Karate Federation (WSKF) will lead by promoting the game as a world sport, protecting the spirit of the game i.e. Sports-Karate and optimizing commercial opportunities for the benefits of the game and all non-olympic sports worldwide. (http://www.wskf.org). Dr. Mohammed Seraj ANSARI has became Chairman of INTERNATIONAL SUPER-CRICKET COMMITTEE -ISCC, The ISCC is the International Governing Body for Super-Cricket, the International Super-Cricket Committee will lead by promoting the game as a world sport, protecting the spirit of the game i.e. super-cricket and optimizing commercial opportunities for the benefits of the game and all non-olympic sports worldwide. (http://www.iscc-super-cricket.org). Dr. Mohammed Seraj ANSARI has became President & Chairman of following organization to promote Non-Olympic Brand thought-out the world. Dr. Mohammed Seraj ANSARI has created quarterly publication and become a Editor-in-Chief for NON-OLYMPIC TIMES - NOT, The NOT is the world largest Sports news paper and acting as a International Publication company which supports all education field professionals. (www.nonolympictimes.org ). Dr. Mohammed Seraj ANSARI has become a Editor-in-Chief for Journal of Management and Science-JMS, Journal of Management and Science-JMS is an international, free-access, printed / online quarterly journal published in English. The aim of JMS is to publish original articles and review papers without delay in all fields of Management and Science. (http://www.jms.nonolympictimes.org ). Dr. Mohammed Seraj ANSARI has involved in social activities and supported Amnesty International. He raised the voice for young youths and for all minority communities. (www.amnesty.org), Dr. Mohammed Seraj ANSARI has got elected by 1st General Election of Amnesty International, over 200 countries have voted, and won highest votes amongst 4 got elected from the world. 2013	Doctorate in Physical Education under West Coast University of Panama, Major Field as Martial Arts. •	Received “Golden European Award For Quality & Business Prestige-2016, by “WORLD BUSINESS ASSEMBLY, SPAIN.” •	Manager of the Year’ medal 2016 by Socrates Almanac Editorial Board, Oxford, London UK. •	Best Enterprise Award 2016 by by Socrates Almanac Editorial Board, Oxford, London ,UK. •	Managing Director of Meraj Realty & Infrastructures Private Limited (www.mrigroup.in), (www.mybasera.com). •	Served as a Board Member of ten non-profit organizations.